The VW 2.0 TSI / TFSI EA888 is a 2.0-liter four-cylinder gasoline turbocharged engine based on the 1.8 TSI/TFSI of EA888 series. The production of the 2.0 TSI engine started in March 2008. It was released as a replacement for the 2.0 TSI engines of the previous ЕА113 family. Just like the 1.8 TSI engine, this two-liter version went through a series of changes during the production time. There are three generations of the last VW 2.0TSI engine. The 2.0TSI EA888/1 is known by following codes: CAWA, CAWB, CBFA, CCTA, and CCTB. Just like 1.8TSI, the 2.0l engine has a cast iron cylinder block with the 88 mm (3.46 in) cylinder spacing and 220 mm height. The displacement growing was achieved by the new forged steel crankshaft with 92.8 mm (3.65 in) stroke while the bore size was kept the same. Also, the engine has the short connecting rods (144 mm) and other pistons lower the compression ratio to 9.6:1. The engine block is equipped with two chain-driven counter-rotating balance shafts. 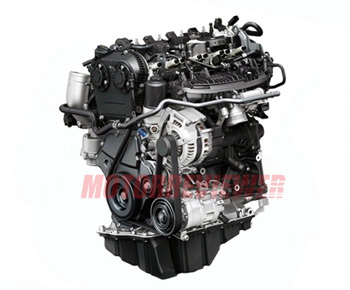 The aluminum 16-valve cylinder head of 2.0TSI is similar to the 1.8TSI head. There are two intake and two exhaust valves per each cylinder. The intake valve diameter is 34.0 mm; the exhaust valve diameter is 28.0 mm; stem diameter for both valves is 6 mm. The valvetrain has low-friction roller finger cam followers and hydraulic tappets, for valve clearance compensation. The intake and exhaust camshafts are on top of the head and they are driven by the timing chain. The intake camshaft is equipped with the variable intake valve timing system. The 2.0 TSI Gen1 has direct fuel injection with homogeneous mixing. The low-pressure fuel pump mounted in a tank delivers fuel to the high-pressure pump supplying up to 190 bars (2,760 psi) of fuel pressure for the six-hole fuel injectors. The high-pressure injection pump is driven by a four-lobe cam on the exhaust camshaft. The engine also has the electronically controlled ignition with long-life spark plugs and four individual single spark coils. The engine is turbocharged by the water-cooled and integrated into cast iron exhaust manifold turbocharger KKK K03 with the max boost pressure of 0.6 bar (8.7 psi). The compressed intake air goes through the plastic variable geometry intake manifold. The whole operation is controlled by ECU Bosch Motronic MED 17.5. The 2.0 TSI Gen1 with 2 lambda probe sensors meets the European emission standard Euro 4 (CAWB, CAWA engines) and ULEV 2 (CCTA, CCTB engines); CCTA version has 3 lambda probe sensors and meets the Californian SULEV standard. The 2.0TSI EA888/2 has appeared also in 2008 and had the same bunch of modifications as the 1.8 TSI Gen2. The main target was the friction reduction and efficient increasing. For this purpose, the diameter of the main journals was reduced by 6 mm (58 mm to 52 mm). Also, the low-friction thin pistons rings, new pistons and a new method for cylinder wall surface manufacturing were applied. This generation has a variable oil pump. In addition to that, the 2.0TFSI engines for Audi applications were equipped with AVS system (CCZA, CCZB, CCZC, and CCZD engines). It is a two-stage intake valve-lift control. The system varies the valve lift in two stages: 6.35 mm and 10 mm after 3,100 rpm. The 2.0 EA888/2 meets the higher emission standards comparing to EA888/1 – Euro5 (CDNC engine) and ULEV 2 (CAEB engine). The production of these engines continued until 2015. The 2.0TSI EA888/3 or Gen3 was designed to be lighter and more efficient. First of all, the engine got a new cast iron cylinder block with thinner walls by 0.5 mm (3 mm instead of 3.5). There are new steel crankshaft, pistons and rings, oil pump and light-weight balancing shafts. The new engine design incorporates an entirely redeveloped cylinder head. It is a 16-valve aluminum DOHC cylinder head with an integrated and water-cooled exhaust manifold. Like before, the camshafts are driven by the timing chain and AVS system is applied for the intake valves only. But the variable valve timing system is available for both camshafts. The 2.0TSI EA888/3 is equipped with dual injectors. One set is mounted in the port (MPI) and another set is inside the cylinders (direct injection), for that extra efficient power when needed. The max boost was increased up to 1.3 bar (18.8 psi). It became possible by installing the new turbocharger (IHI IS20) with a new electronic wastegate, which adjusted the boost pressure. The CULA, CULB, CULC, CPLA, and CPPA versions are equipped with a smaller and less powerful turbocharger - Garrett MGT 1752S. For high-performance vehicles, the engineers did some improvements in the design. The engines with code CJX have slightly different cylinder head shape, performance intake camshaft, bigger exhaust valves, reduced compression ration to 9.3:1, new pistons, more productive injectors, and high-pressure fuel pump. The engines are turbocharged by IHI IS38 with the max boost of 1.2 bar (17.4 psi). More powerful versions come with a big air-to-air intercooler. The Gen3 engines are equipped with Siemens Simos 18.1 electronic engine control unit (ECU). The upgraded 2.0 TSI EA888/3 corresponds to the latest emissions regulations such as Euro 6 for the European market. It may seem strange but all the main problems were inherited from the 1.8TSI EA888 engine without any changes in the worse or better direction. There are problems with stretched timing chain, high oil consumption, carbon deposit inside ports and on intake valves. You can read detailed information about common problems for each generation in this review for the 1.8TSI/TFSI EA888. But everything is fixable. The cast iron engine block is rebuildable, solutions for fixing common problems are already found and replacement parts are not very expensive. Pour the high-quality engine oil, feed with minimum 95 RON gasoline, follow the maintenance schedule precisely and the engine will last for about 150-200k miles (250,000-300,000 km). The engine longevity doesn’t drop down after Stage 1 (ECU remapping) and even after Stage 2 (downpipe, more productive turbocharger, and ECU remap) depends on how much power you will get. But of course, Stage 3 will reduce the reliability significantly. CAWA - 125 kW (170 hp) at 4,300-6,000 rpm, 207 ft lb (280Nm) at 1,700-5,000 rpm. This is engine for the VW Tiguan. CCZC - 125 kW (170 hp) at 4,300-6,200 rpm, 207 ft lb (280Nm) at 1,500-4,200 rpm. Application: VW Tiguan, Audi Q3. CCZD - 132 kW (178 hp) at 4,500-6,200 rpm, 207 ft lb (280Nm) at 1,700-4,500 rpm - another engine for the VW Tiguan. CCTA/CBFA - 147 kW (200 hp) at 5,100-6,000 rpm, 207 ft lb (280Nm) at 1,800-5,000 rpm. Application: VW Golf Mk5 GTI (for US market only), VW Golf Mk6 GTI (for US market only), Audi Q3 (for US market only), VW Jetta Mk5/Mk6, VW Passat B6, VW CC, Audi A3 (8P). CAWB/CCZA - 147 kW (200 hp) at 5,100-6,000 rpm, 207 ft lb (280Nm) at 1,700-5,000 rpm. Application: Audi A3 Cabriolet, VW Scirocco, VW Tiguan, Audi TT, Skoda Superb Mk2 (3T), Skoda Octavia. CPSA - 155 kW (211 hp) at 5,000-6,200 rpm, 221 ft lb (300Nm) at 1,800-4,900 rpm. The engine version is for Audi Q3. CCZB - 155 kW (211 hp) at 5,300-6,200 rpm, 207 ft lb (280Nm) at 1,700-5,200 rpm. The engine was installed in VW Golf Mk6 GTI, VW Scirocco, VW Passat B6, VW CC, VW Tiguan, SEAT Altea Freetrack, SEAT Leon FR. CAEA/CDNB - 132 kW (179 hp) at 4,200-6,000 rpm, 236 ft lb (320Nm) at 1,500-4,000 rpm. Application: Audi A4 (B8), Audi Q5, Skoda Kodiaq. CAEA/CAEB/CDNC - 155 kW (211 hp) at 4,300-6,000 rpm, 260 ft lb (350Nm) at 1,500-4,200 rpm. Application: Audi A4 (B8), Audi A5, Audi Q5, SEAT Exeo. CAEA/CAEB/CDNC - 155 kW (211 hp) at 4,300-6,000 rpm, 258 ft lb (350Nm) at 1,600-4,200 rpm. It is Audi TT Mk2 engine. CHHB - 162 kW (220 hp) at 4,500-6,200 rpm, 258 ft lb (350Nm) at 1,500-4,000 rpm. Application: VW Golf Mk7 GTI, VW Tiguan 2, Audi A3, Skoda Superb, Skoda Octavia RS. CNCD - 165 kW (224 hp) at 4,500-6,250 rpm, 258 ft lb (350Nm) at 1,500-4,500 rpm - Audi Q5 engine. CHHA - 169 kW (230 hp) at 4,700-6,200 rpm, 258 ft lb (350Nm) at 1,500-4,600 rpm. The engine can be found under a hood of VW Golf Mk7 GTI Performance and Skoda Octavia RS230. CJXE - 195 kW (265 hp) at 5,350-6,600 rpm, 258 ft lb (350Nm) at 1,500-4,000 rpm – high-performance engine for the SEAT Leon Cupra. CJXA/CJXB - 206 kW (280 hp) at 5,100-6,500 rpm, 280 ft lb (380Nm) at 1,800-5,500 rpm. Application: SEAT Leon Cupra, Skoda Superb. CJXD - 213 kW (290 hp) at 5,900-6,400 rpm, 258 ft lb (350Nm) at 1,700-5,800 rpm – one more high-performance engine for the SEAT Leon Cupra. CYFB - 215 kW (292 hp) at 5,400 rpm, 280 ft lb (380Nm) at 1,800 rpm. Application: VW Golf Mk7 R for the North American market. CJXC - 221 kW (300 hp) at 5,500-6,200 rpm, 280 ft lb (380Nm) at 1,800-5,500 rpm. Application: European VW Golf Mk7 R, Audi S3, SEAT Leon Cupra. CJXG - 228 kW (310 hp) at 5,500-6,200 rpm, 280 ft lb (380Nm) at 1,800-5,500 rpm – the most powerful version available for Audi TTS.